In the Manasses Henry Furniture Company "Heritage" is not just another word. It's at the heart of the business .. In fact, it's the cornerstone on which this business was built. In the mid-1800s, an Amish farmer named Manasses Hochstetler came to Indiana. As he cleared the land for his farm, he used the wood to build furniture for his family. He passed this skill on to his son Cornelius; Cornelius passed it on to his son Henry, and so on down the line. This rich heritage is the foundation for Manasses Henry Furniture Company, owned and operated by Gene Beachy, the great-great grandson of Manasses Hochstetler. Many of the original pieces built by the family as far back as the mid-1800s are still being used today and passed down from one generation to the next. One of the original pieces built in 1933 by Henry Hochstetler is on display in the showroom as a model for quality and craftsmanship. What is so special about these pieces and why do they last so long? The answers to these questions give us not only a glimpse into the past, but a view of the present. Manasses Henry Furniture Company uses the same techniques as they build furniture today. .At Manasses Henry Furniture Company, every piece is made from solid lumber construction. The finest northern hardwoods - oak, cherry, pine, maple, walnut and quarter sawn white oak- are harvested especially for this furniture. No plywood, chipboard or veneers are used in any part of the pieces. Where else can you find such quality features as solid lumber drawer bottoms, dovetail drawers, mortise and tenon joints, and hand-rubbed linseed and watco oil finishes? At Manasses Henry Furniture Company, many pieces are replicas of actual family heirlooms. To the craftsmen, making furniture is an art. They build pieces using the same time-honored techniques their grandfathers used. All the pieces at Manasses Henry Furniture Company are built on-site, with the exception of some chairs, which are built by Amish artisans in the area. From bedroom and dining room suites to chairs, sofas and accompanying pieces, Manasses Henry Furniture Company builds 165 different pieces. These pieces are not built on an assembly line; each piece is bench-built by one craftsman, signed and dated for posterity. Pieces in the showroom can be mixed and matched. For example, you can choose a specific table you like, and then select the style of chair you prefer. What if you have something else in mind? No problem. The motto of Manasses Henry Furniture Company is "If you can dream it, we can build it." Simply bring your idea to them and watch your dream become a reality. The made-to-order furniture is given the same attention to detail as all our pieces. Manasses Henry Furniture Company can custom make bedroom and dining room suites, wall units, kitchen cabinets, and other pieces exactly to your specifications. Manasses Henry Furniture Company is located on State Road 13 in Middlebury, easily accessible from Exit 107 on I-80/90. The beautiful 6,000 square foot showroom carries in-stock items, available for immediate delivery. Custom orders are also handled on a timely basis, within 12-14 weeks. 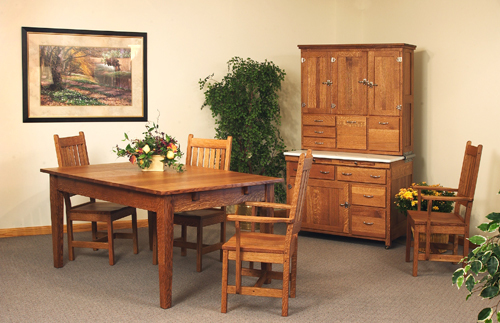 When you visit the showroom in Middlebury, you can watch the craftsmen actually create the furniture. Manasses Henry Furniture Company now has a 4,000 square foot showroom in downtown Noblesville, IN at 930 Logan Street. Manasses Henry Furniture Company is carrying on a tradition that began over 150 years ago. Every piece of furniture carries with it the pride and craftsmanship of the builder. At Manasses Henry Furniture Company, you can purchase future heirlooms today.